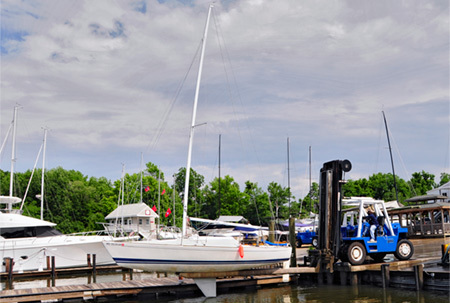 Here at Bert Jabin Yacht Yard, we like to give boaters year-round flexibility to haul-out and launch at their leisure. Our 35, 50, and 75-ton travel-lifts splash boats in the spring, put them to bed for the winter, and execute swift hauls and launches daily throughout the boating season and beyond. We’re equipped to haul vessels with a maximum beam of 20.5 feet. Easy mobility allows us to haul to our work area, where environmentally friendly filtration cloths are placed under your boat prevent contaminants from seeping into the Bay. We perform short-hauls for buyers and sellers doing surveys, or just for a quick bottom power wash. We can also offload and load to trailers for those not traveling by sea. Contact us for more information or to schedule your boat for a haul or launch.